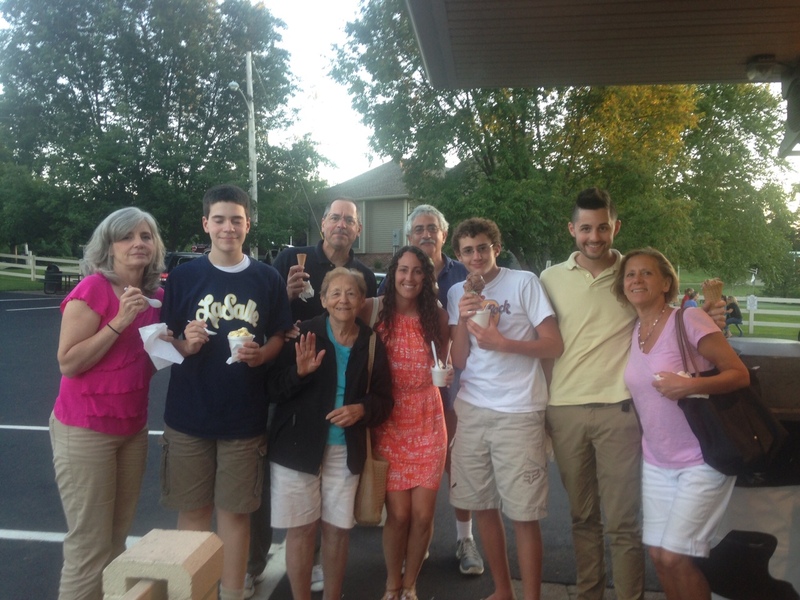 Simple pleasures, like enjoying ice cream with visiting family members, was a special part of our summer. Late summer is always a somewhat melancholy time. The first yellow leaves appear on the trees, like the first stray gunshots in a revolution; the perennials are finishing their halfhearted secondary blooming; the school bus pass arrives, reminding our teen that his carefree summer vacation days will be over soon. We’ve set the date for closing the pool, the site of our stay-cation. Today I’m feeling a little empty because the last of our summer visitors have departed. Bob’s brothers – Mike and wife Erica, and Tom and wife Linda – left yesterday after visiting for a long weekend from California and Switzerland. Bob’s cousin Joe, who is like a brother to him, and wife Bhavani drove up from Long Island to see everyone. A few weeks earlier two of our grown children, Rachel and Ryan, flew in from Los Angeles and Brighton, England for a week. My mom spent three weeks with us during the hottest part of the summer, enjoying the shaded patio and the air conditioning. My brother Dan visited with his wife Elena and son Tom for the first time in 15 years; my sister Julie drove up from Scranton for a weekend. Other visitors included cousins Nancy and husband Paul from Florida; their daughter Christy, son-in-law Tommy and adorable one-year-old twins; our nephew Dan and new wife Cat; and cousin John and wife Katharine. All of these visits from family have made it a memorable summer. Some of you whose families live too close may be tempted to say “so what?” or even to shudder at the thought of so much company. But anyone whose families live too far away to be part of their everyday lives will understand. Bob and I love the Boston area; we have built a life together here, replete with some great friends. We are fortunate that three of our five grown children live within an hour’s drive. But the rest of our families – the ones who were part of our childhood or who endured our early parenting mistakes; who know our secrets, our insecurities and our worst selves but love us anyway — are in different parts of the country and on different continents. As we get older, we yearn to pull them closer. But our lives rush by, and finding time and energy to connect is hard. This summer, fresh after installing our new pool, Bob and I made a full-court press to get more family members out here. Just before each wave of visitors I usually got a wave of panic. I worried about planning delightful meals, scheduling stimulating activities so our visitors wouldn’t get bored, removing the schmutz on the powder room sink, whether the sheets smelled fresh enough and whether the closets were neat enough. I tend to put too much pressure on myself and irrationally assume that our visitors – even those we love — will be as hard on me as I am on myself. With my own kids I worried about making up for our long separation with endless intimate conversations. I wondered whether being with them would painfully remind me of how separate our lives have become. But from the moment each wave of company arrived I realized how silly I was to worry; I just let go and basked in the joy of having them close. We ended up just hanging by the pool or the hot tub, having long talks over very un-gourmet meals, taking walks, going out for ice cream and doing very little else. In short, the perfect stay-cation. 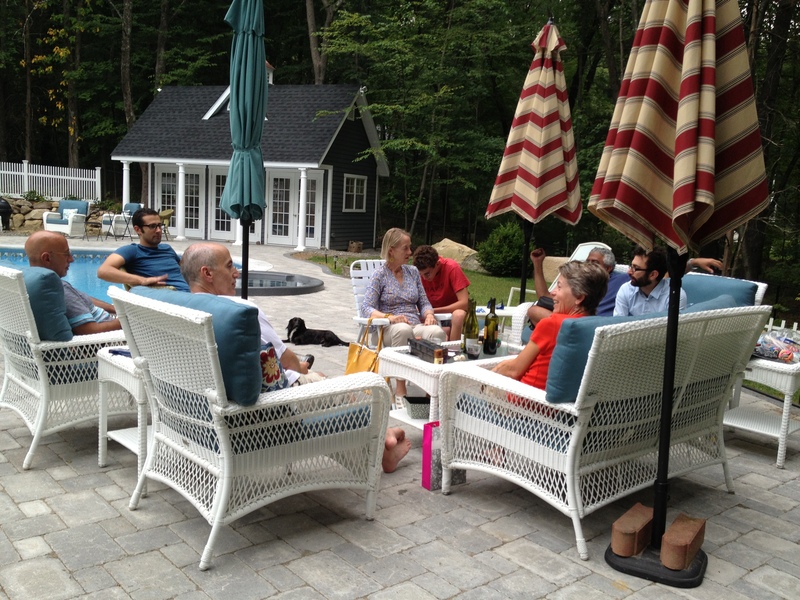 Sharing conversation with my husband’s brothers and their wives. • Sharing the hot tub with my children Rachel, Ryan and John, and singing along to a playlist Ryan made of early 90s songs, the soundtrack from our days at our old swim club when Rachel and Ryan were little. • Watching Bob’s kids Rachel, Jesse and Ben float blissfully on rafts around the pool. • Playing trivia games with Jesse, John and Jesse’s friends Chris and Kayla. • Watching our kids’ delight as they towed dogs Gus and Rita around the pool on a raft. • Seeing Bob relaxed, happy and deep in conversation with his brothers Tom and Mike and cousin Joe over late afternoon beers. • Walking our dog Gus with John and sisters-in-law Linda and Erica — both beautiful, smart, strong women who are great role models and friends. • Talking with my cherished sister Julie about our families and the great meals we have known, as we sipped wine out of plastic glasses and dangled our feet into the pool. • Seeing my mom playing affectionately with our two dogs and surreptitiously slipping Gus half her sandwich — and realizing that she is a closeted dog lover who will never admit it. • Having long stretches of quality time with my brother Dan, the sibling I see least, and listening to the passionate, intelligent and respectful discussion he had with my son Ryan about God and the universe. Regretting the long spaces between our visits. • Introducing cousins Nancy and Paul to the joys of Pearl Hotdogs, which made them so happy that they planned to order 10 pounds of them to ship to their home in Florida. • Watching Christy’s one-year-old son Benjamin take a dive into the pool and seeing her quick recovery of him. Regretting how quickly those years slipped away. Call my agent! The pool gives us an excuse to take a much-needed break from work. 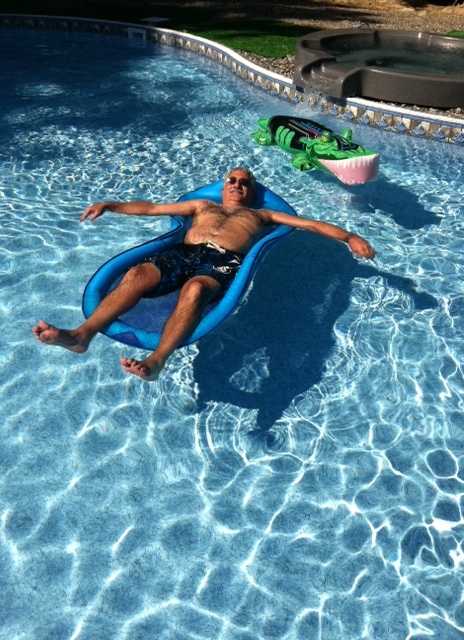 After 20 summers of wishing and hoping, my husband Bob finally achieved a longtime dream: a backyard swimming pool and spa. Bob has been talking about a pool since he bought our home 20 years ago, before we were married or even dating. “It has the perfect back yard for a pool!” he announced the first time I visited his new home, when I was living 350 miles away and we were merely friends. Over the next five years we fell in love, married, and his home became our home. We expanded the house to accommodate our blended family. Ten years after that, with college costs largely done, we renovated our totally dysfunctional kitchen. Then came the dining room and other unglamorous but necessary renovations, like a new driveway. Can you tell that I went into this pool thing reluctantly? Any financial advice regarding home improvements will tell you that pools are the junk bonds of renovations, with little chance of making back your investment. A pool might make the house hard to sell because people are afraid of the liability. And of course the pool is just the first stage of the financial hemorrhage. The tree clearing, the electrician, the energy-efficient pump, the decking, the fencing, the poolside furniture, the pool toys, the weekly maintenance…all add to the real cost. In short, there is never a good time to cannonball into such an expense. But most people who’ve taken the plunge will tell you that the decision is emotional rather than practical; otherwise nobody would install one. A pool represents a reward for hard work and a respite from it; a place to welcome friends and neighbors and for children to hang out with buddies; a carrot to lure adult children home for a visit. That last selling point convinced me to sign on the dotted line. Reason #2 to have a pool: Our grown kids now have an incentive to visit. visited the local pool showroom, talked with family and friends who’ve installed them about the tradeoffs of vinyl versus gunite, and dragged templates for various sizes and shapes of pools around our yard. Finally, settled on a lagoon-shaped pool and wrote the first big check and then the excavators arrived, unearthing boulders resembling mutant baked potatoes. A few weeks later, after running our hose for four days to fill it, we opened the pool. It delivered on all of its promises the first week. Our grown children visited on John’s 14th birthday and enjoyed the pool and each other, while John played Marco Polo with his friends until they were red-eyed from pool water. On another day we invited our next-door neighbors to come for a swim, and they brought champagne so we could enjoy the spa like rap stars. Bob has begun arranging his workday so that he can carve out some pool time in early afternoon, when the sun is warmest and the pool water shimmers. Watching my workaholic husband swimming laps, relaxing on a float and enjoying our yard for the first time melted away the last of my reluctance over whether this was the right thing. The pool has also encouraged us to be a little goofier. We bought a blowup alligator and shark. We started a rule with some of our close friends that our pool must be an otherworldly place where life can be like a Hollywood musical; where guests are encouraged to break into song whenever possible. Last night, fully sober, we sat in the spa with our friends Linda and Bill under a starlit sky and sang the theme songs to “Mr. Ed,” “Petticoat Junction” and other long-lost TV sitcoms. Next year we’ll put in a patio around the pool and a shed (Bob calls it a “pool house,” and I am trying to promote the “shed” concept) for all the poolside furniture and for guests to change. He now says he wants to carve out a play area near the pool “for little kids.” Whose little kids?, I wondered. And then it dawned on me what this pool really is: a commitment to staying where we are for a long time, possibly forever. We’ve talked idly in the past about downsizing to a smaller place, perhaps in a really great town where we can walk to everything, once John goes off to college. But the pool strengthens our ties to this home, and our children’s ties too, so we don’t talk about that any more. Now we know we’ll be here when we really need the handrail to go down the steps into the shallow end, when grandchildren are playing Marco Polo; when the spa is used to soothe arthritic joints instead of as a place to feel like Jay-Z. The pool doesn’t say that we’ve “arrived,” just that we are never ever leaving. And I’m happy with that!